Professional and impressive, our Cast metal three dimensional Adrianna Bold sign letters will add everything and more to your business setting. In order to achieve the professionalism and style your company deserves, the only thing you can do is to use futura condensed cast metal letters. Metal letters used for outdoor building letters & reception area metal wall letters add a sense of class and beauty to any wall or building no matter what the size of the letter. The Futura Condensed cast metal dimensional letters are perfectly crafted and designed with your choice of font and finish and are used by cell phone companies & engineering consultant firms all over the world. Gemini’s futura condensed cast metal letters are cost efficient, earth-friendly, easy to install, produced quickly and are guaranteed for life. Futura Condensed heavy metal letters are available in 4, 6, 8, 10, 12, 15 & 18 inches in height and available in upper case letters. 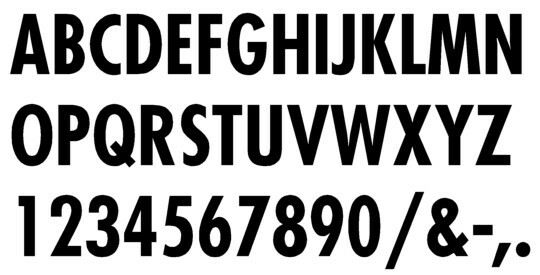 Futura Condensed metal letters is a sans-serif font that is available in a flat face. There isn’t much more you can ask for from a top of the line manufacturer of many different types of wall dimensional letters. Many businesses like packaging companies & escrow offices use these letters to add a bit of pizzazz to their exterior building metal lettering & marquis cast metal dimensional letters. With such a high quality and advanced product, there are many options available as to what you can have done with large metal letters when using them for outdoor building letters & reception area metal wall letters by cell phone companies & engineering consultant firms and many other businesses. Among many different standard fonts and finishes, thicknesses and sizes, the possibilities are endless for what you can do. There are 21 different finishes available for futura condensed metal letters. Gemini features more than 60 standard styles with many different finish options. For larger sizes we can have it backed with LED lighting. When you receive your custom metal letters you may be wondering what all goes into making them. They are quite involved in the production process, though every time, a perfect product comes out that is finished and closely inspected by hand. When a metal letter is created, molten metal is poured into a mold and is set to solidify. This is the casting process. This process has been around for hundreds of years, used by craftsmen to create their exterior building metal lettering & marquis cast metal dimensional letters. For true quality from start to finish, Gemini has it's own state-of-the-art foundries for the quality you are looking for in your futura condensed cast metal letter. Wether you are going to use your futura condensed cast metal letter for outdoor building letters & reception area metal wall letters or exterior building metal lettering & marquis cast metal dimensional letters, you will be in awe with our hand-finished cast aluminum and bronze letters for their classic look, deep dimension and durability. We offer the largest variety of font styles, profiles, finishing options, and the flexibility to customize for your needs. Environmentally SMART! Your futura condensed cast metal font is manufactured in our all-electric, pollution-free furnaces, our customizable cast products are made from earth-friendly alloys free of lead and mercury. Each futura condensed cast metal letter is finished to your specifications in-house for quality assurance and tested to last a lifetime or we’ll replace it, free. Order your futura condensed cast metal sans-serif style dimensional letters with a flat face in any of the following heights (4, 6, 8, 10, 12, 15 & 18 inches) TODAY to receive the below special offer!